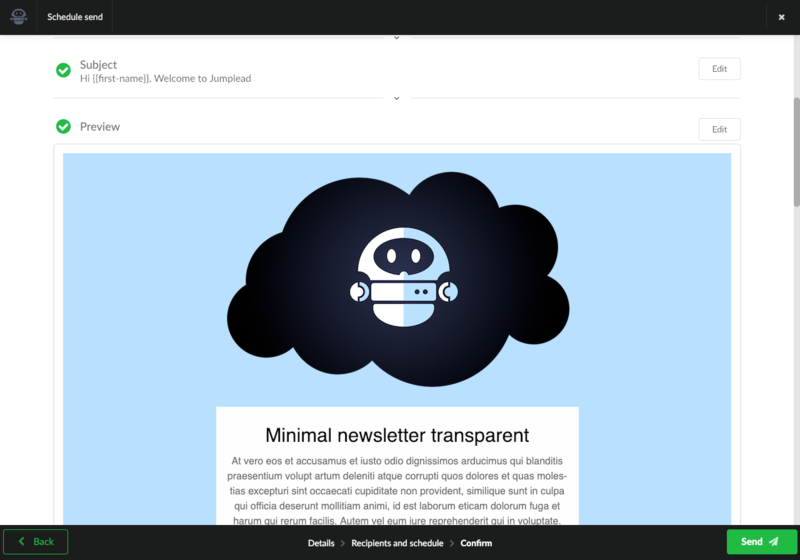 Emails are created in the 'Emails' tab within the Emails section of Jumplead. 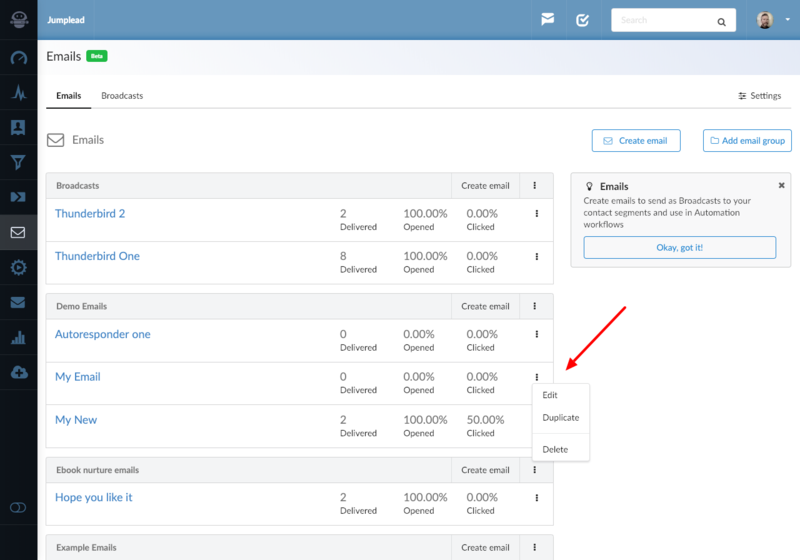 When you create an email it is listed in this page so you can find it easily in the future. You can also create 'Email groups' to keep your emails organised. 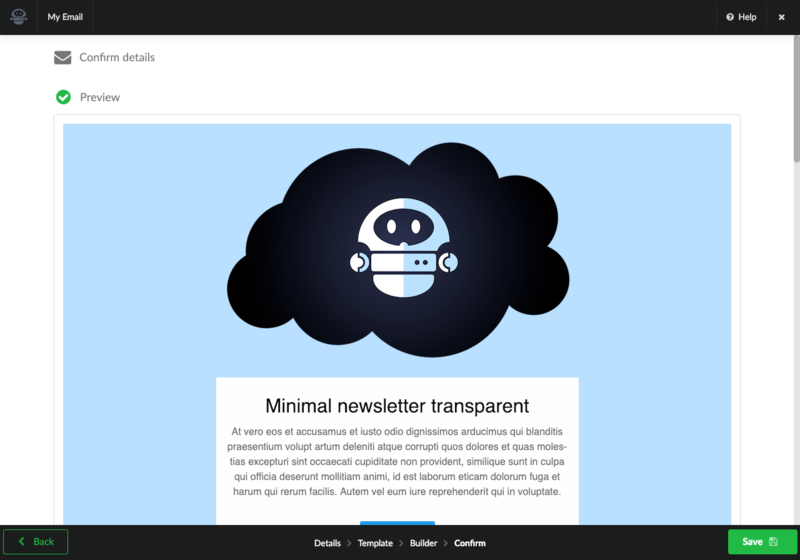 To create a new email, click the 'Create email' button in the top right hand side of the page. 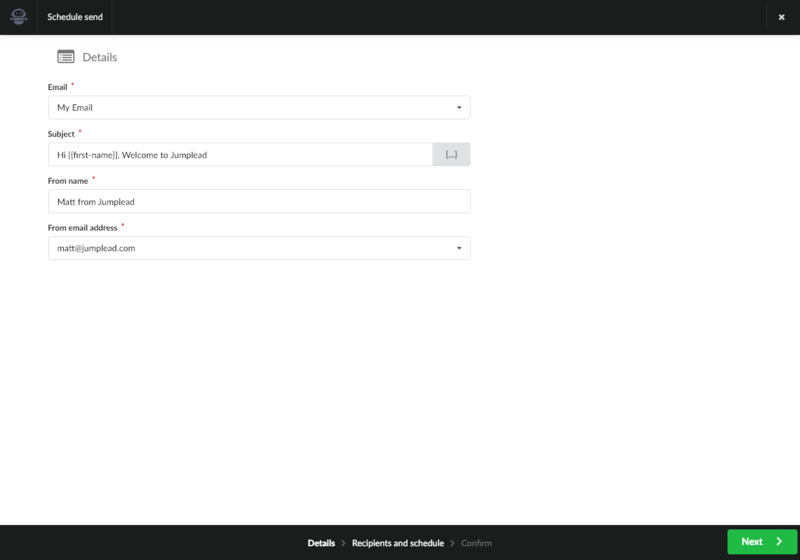 This opens up the email creation wizard which takes you through the four steps required to make an email in Jumplead. 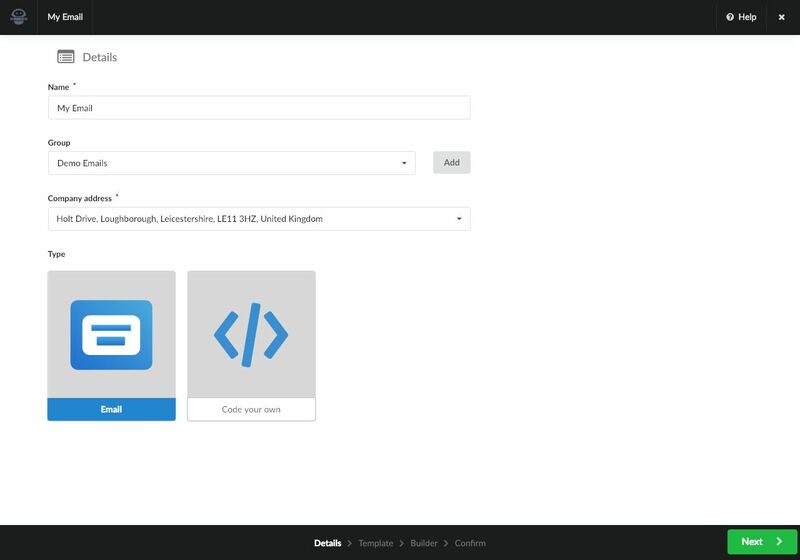 First add some details, giving your email a name, adding it to a group, and selecting the company address that relates to this email. You can choose to either create and email with the drag and drop editor, which automatically makes your email responsive and ensures good display across email clients. Alternatively you can choose to code your own. Click the 'Email' icon and the 'Next' button on the bottom right to move to the next step. 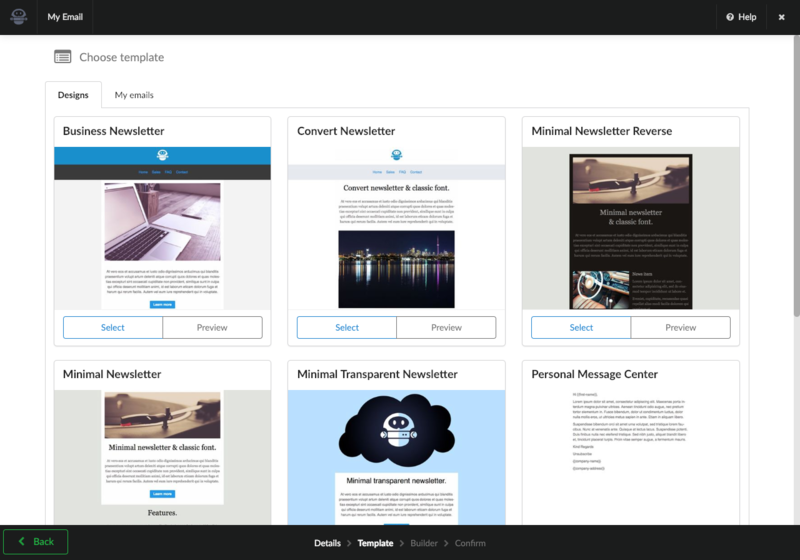 You can now choose a starting template to base your email design on. Don't worry if none of these look perfect straight away, as they are all completely editable by you to get the exact design you require. 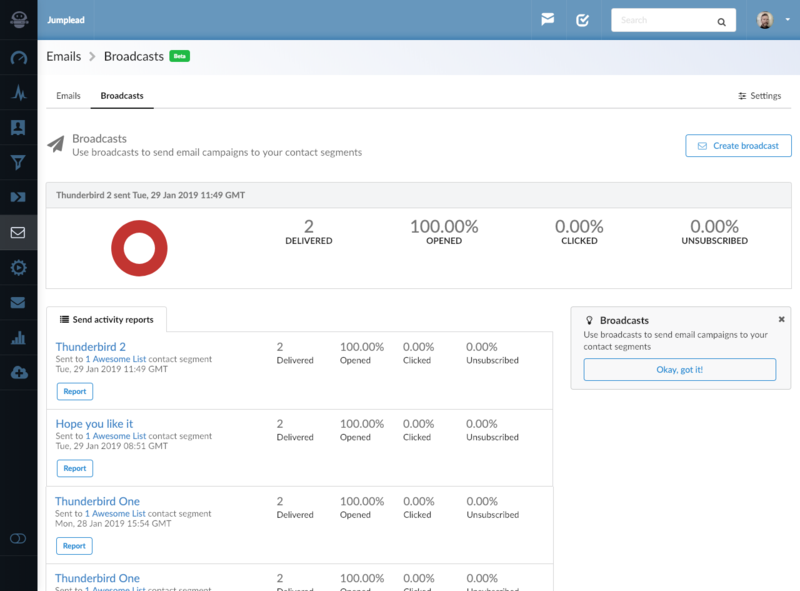 If you want to start with an email that you have already created, you can click the 'My emails' tab at the top of the page and select it from there. When you find the email design you want to start with, click 'Select' and then the 'Next' button in the bottom right of the page. 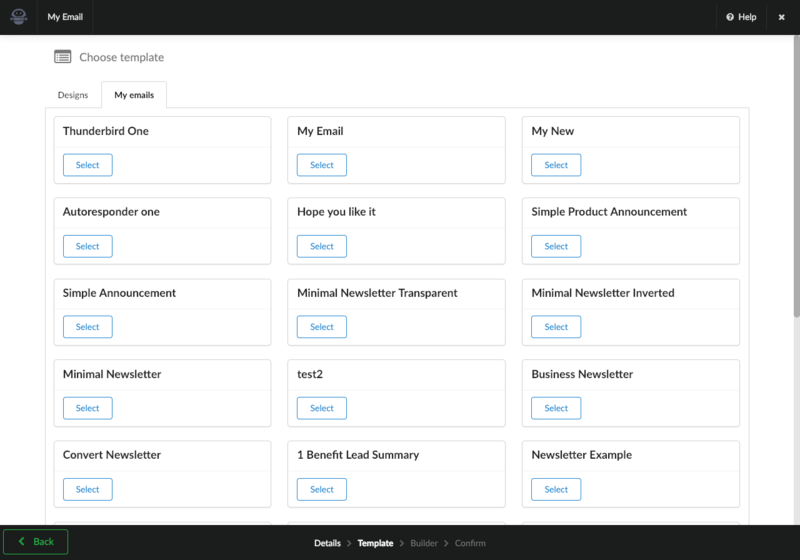 You are then taken in the email Builder, where you can use the drag and drop editor to build your email. You can toggle between desktop and mobile views with the icons in the top left of the page. In the top right there is the ability to undo and redo actions with the anti clockwise and clockwise icons. 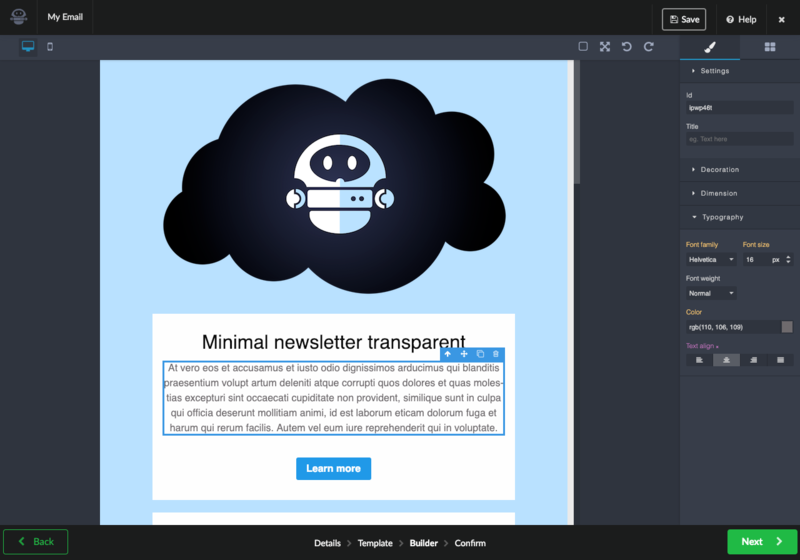 On the right hand side of the page in the side column there are a range of components you can drag in to your email to build it. When an item on the page is selected the right hand side bar contains the settings for that component. Double clicking on a text area, gives you extra options to change the formatting, add lists, and add merge tags to personalise your emails. Click one time on a page component highlights a menu for that item that allows you to delete it, duplicate it, drag it elsewhere. Also clicking the up arrow here allows you to select the component that the current one is in, such as a container. Once you have edited and are happy with your design click the Next button again to see a preview of your email. If you are happy, you can save it and you will be taken back to the Emails tab and your new email will be listed. 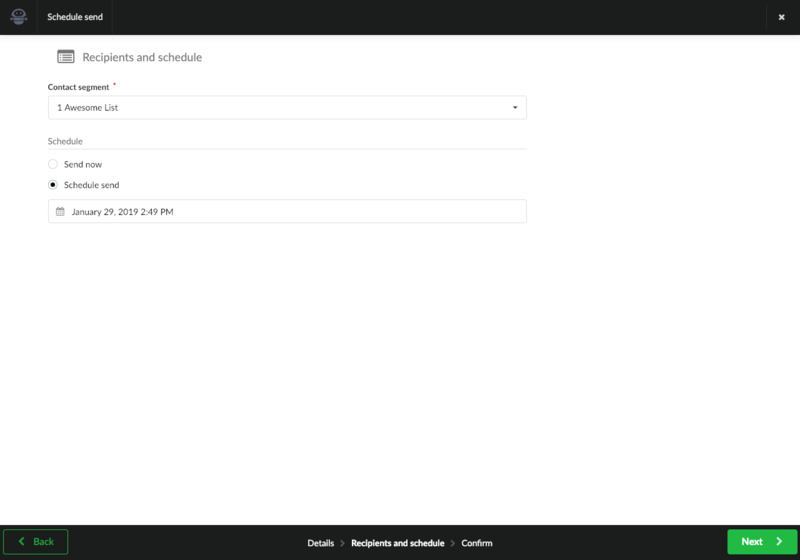 From the menu on the right hand side of the list view of your emails you can choose to edit, duplicate or delete them. Now you have created your email it will be available to send broadcasts to in the Broadcasts section, which is the next tab along. 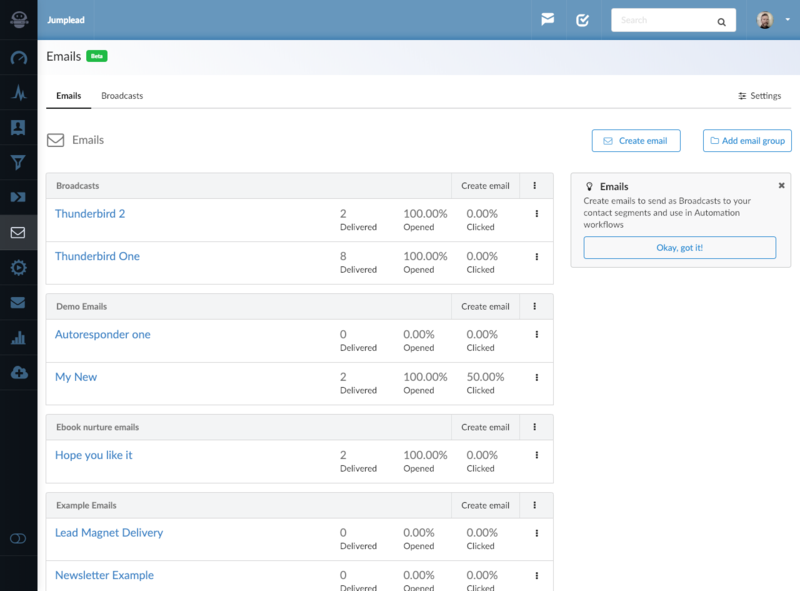 It is also available to you to send as part of a Workflow in an automated campaign.